In some ways, this album is something of a revelation. Granted, Elvis is not at the height of his powers, and there are some truly awful tracks, such as the opening number on this CD, 'Are You Lonesome Tonight'. Sweet Inspirations' Estelle Brown is trying to get Elvis on the right track, but his mind is obviously off to lunch (or worse). But on the other hand there are a couple of real gems, such as a marvelous take on 'Reconsider Baby'. It's not as good as the 1960 studio cut, but it's as least as good, if not better, than the 1969 and 1972 live renditions released by BMG/RCA. Elvis sounds pretty tired during the song, as indeed he does on the whole album, but on this blues classic it actually fit very well with the content of the lyrics. A marvelous performance that is further enhanced by the brilliant lead guitar work of James Burton. 'Moody Blue' is a nice addition to one's live collection if only for the fact that this, to my knowledge, is the only live version around. Elvis mentions that they tried it the night before without success. Unfortunately, it's not very good on this album, either. Elvis' vocal is very strained and uncertain. The band had learned the lesson, though, and they sound brilliant on this song as well as throughout this album. Songs like 'My Way' and 'You Gave Me A Mountain' are delivered with some of the magic of old still at hand, but I've heard many better versions. The real highlights comes towards the end when Elvis decides to play the piano. All of a sudden we are treated to Elvis Presley at his very best. 'Where No One Stands Alone' from the "How Great Thou Art Album" is performed live for the very first time, and Elvis is inspired as well as inspiring in a breathtaking version. Technically, this is perhaps not the most polished I have heard, but the emotional impact is awesome. This is proof that Elvis, although sick and distressed and just plain tired of it all, still had his moments, right up to the very end. 'Unchained Melody' is a more familiar tune, of course, and perhaps that's the reason it doesn't seem quite as exciting and revealing as 'Where No One Stands Alone', but it's a great version, a powerful performance, and definitely among the best tracks I've heard with 1977-era Elvis. This is a fine album that deserves it's place in every serious Elvis-collection. About the only thing wrong with it is the rather cheap cardboard cover, although the pictures are quite nice. 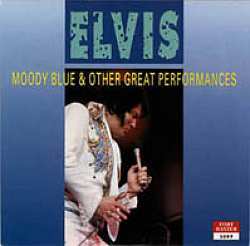 The sound is perfect, in fact it's better than the BMG/RCA CD-release of "Elvis In Concert".